The Jewish Museum in New York is opening an exhibit of medieval religious manuscripts from the Bodleian Library at Oxford College in England. The Museum will present Crossing Borders: Manuscripts from the Bodleian Libraries from September 14, 2012 through February 3, 2013. This exhibition will feature over 60 Hebrew, Arabic, and Latin manuscripts, the majority of which have never been seen in the United States. The works range in date from the third century to the late sixteenth. This exhibition is based on Crossing Borders: Hebrew Manuscripts as a Meeting-place of Cultures co-curated by Piet van Boxel and Sabine Arndt for The Bodleian Library. The New York City presentation has been organized by The Jewish Museum’s Curator Claudia Nahson. The exhibit showcases a selection from the Bodleian’s world-renowned holdings within the larger context of the history of medieval Christian Hebraism – the study by Christian scholars of the Hebrew Bible and rabbinic sources, which first received full expression in the twelfth and thirteenth centuries. As Protestantism took hold in the sixteenth century, Hebraist trends resurged, sparking interest in the collecting of Hebrew books, and propelling the formation of the Bodleian’s outstanding Hebraica collection. Scholar and diplomat Sir Thomas Bodley began establishing the Bodleian Library in 1598 after retiring as ambassador to Queen Elizabeth I and devoted the rest of his life to building its collection. Bodley reopened the library room at Oxford that had been completed in 1488 to house a collection of manuscripts given by Duke Humfrey of Gloucester (1390-1447). But in 1550 during the Reformation, it was stripped and left abandoned. A staunch Protestant, whose family had fled England during Queen Mary’s Catholic reign, Bodley was also a humanist and Christian Hebraist who viewed the creation of a Hebraica collection as integral to his vision for the new library. It would be housed in a masterpiece of English Gothic and Jacobean architecture, and is today one of the oldest libraries in Europe. Composed of three thematic sections, the exhibition will open with three beautifully illuminated Hebrew manuscripts representing the main European centers of medieval production—Ashkenaz (Franco-German origin), Sepharad (Spanish or Portuguese origin) and Italian. The first section covers the early dissociation between Christianity and Judaism to later medieval Christian attempts at finding common ground with Judaism. Reinforcing the early separation between the two faiths, Christians began using the codex or book while Jews held fast to the roll format. Leaves of the codex could be used on both sides and be made more portable, unlike scrolls, and thereby accelerated the propagation of Christianity. On view will also be one of the two earliest Latin Gospel Books extant from the British Isles, dating to the late 6th or 7th century, and one of the earliest known Hebrew codices. By the middle of the 12th century, Christian scholars began seeking out learned Jews to explain readings of the Hebrew Bible and, by the 13th century, actively studied the language, consulting original Hebrew texts in an effort to better understand the Scriptures. A great cross-fertilization between Christians, Muslims and Jews occurred during the late Middle Ages in arts, sciences and the culture at large, which is the focus of the second section. Significant works by Greek, Muslim and Jewish authors were translated from Arabic to Latin, often with the help of Jewish scholars. Writings of famous ancient Greek thinkers like Aristotle, Hippocrates, Euclid and Ptolemy were suddenly available, making a world of ideas accessible to many in Europe for the first time. The most famous work in the show, the magnificent Kennicott Bible, is displayed in this section with its Islamic, Christian and popular motifs merging in one single work. A Jewish scribe and a Jewish artist created this beautifully illuminated manuscript in Corunna, Spain in 1476, almost two decades before the expulsion of the Jews from the Iberian Peninsula. 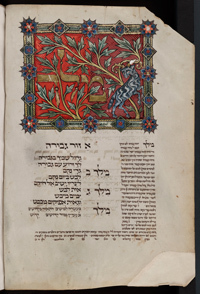 The final section is devoted to understanding the Bodleian’s Hebraica collection as an important sign of Christian Hebraism’s resurgence in the 16th century. Some of the most exceptional examples of Hebrew manuscripts anywhere, all with stellar provenances, demonstrate the library’s more than four-century-long commitment to Hebraica. Nicholas Hilliard’s exquisite miniature portrait of Sir Thomas Bodley is paired with George Gower’s stunning 1579 portrait of Queen Elizabeth I (reigned, 1558–1603) during whose rule the library was established. A great treasure is Queen Elizabeth’s Book of Oxford presented to the Queen in 1566 upon her visit to Oxford. This book opens with a poem on the importance of Hebrew learning encouraging the Queen to continue the work of her father, Henry VIII, in supporting the study of the language at the university. And so it has been for over 450 years through a royally endowed position that ensures the study of Hebrew and Jewish culture and religion to this day. The cross-cultural approach presented in Crossing Borders: Manuscripts from the Bodleian Libraries is very much in the spirit of Thomas Bodley’s founding vision for his library. In his time as today, it transcends ideological and religious boundaries to create a broader framework within which the rich legacy of Christians, Muslims, and Jews can be better understood. Leadership support for Crossing Borders: Medieval Manuscripts from the Bodleian Libraries is provided by the David Berg Foundation. Generous support is provided by The Achelis Foundation and the Joseph Alexander Foundation, with additional in-kind support from George S. Blumenthal. This presentation is made possible with endowment support from The Jewish Museum Centennial Exhibition Fund and the Horace W. Goldsmith Foundation Exhibition Fund. The Bodleian Libraries of the University of Oxford form the largest university library system in the United Kingdom. They include the principal University library—the Bodleian Library—which has been a library of legal deposit for 400 years; major research libraries; and libraries attached to faculties, departments and other institutions of the University. The combined library collections number more than 11 million printed items, in addition to 30,000 e-journals and vast quantities of materials in other formats. The Old Bodleian is also a major visitor attraction, drawing over 300,000 visitors a year. More information about the Bodleian Libraries and their activities can be found at www.bodleian.ox.ac.uk. Widely admired for its exhibitions and collections that inspire people of all backgrounds, The Jewish Museum is one of the world’s preeminent institutions devoted to exploring the intersection of art and Jewish culture from ancient to modern times. The Jewish Museum organizes a diverse schedule of internationally acclaimed and award-winning temporary exhibitions as well as dynamic and engaging programs for families, adults, and school groups. The Museum was established in 1904, when Judge Mayer Sulzberger donated 26 ceremonial art objects to The Jewish Theological Seminary of America as the core of a museum collection. Today, a collection of 26,000 objects is maintained – paintings, sculpture, works on paper, photographs, archaeological artifacts, ceremonial objects, and broadcast media. The collection is among the three largest of its kind in the world and is distinguished by its breadth and quality. It is showcased in the vibrant, two-floor permanent exhibition, Culture and Continuity: The Jewish Journey, examining the Jewish experience as it has evolved from antiquity to the present. The Jewish Museum is located at 1109 Fifth Avenue at 92nd Street, New York City. Museum hours are Saturday, Sunday, Monday, and Tuesday, 11am to 5:45pm; Thursday, 11am to 8pm; and Friday, 11am to 4pm. Museum admission is $12.00 for adults, $10.00 for senior citizens, $7.50 for students, free for children under 12 and Jewish Museum members. Admission is free on Saturdays. For information on The Jewish Museum, the public may call 212.423.3200 or visit the website at TheJewishMuseum.org. 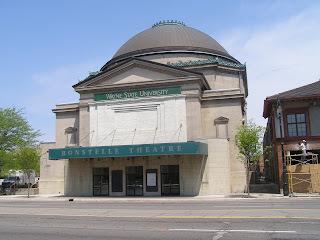 (ISJM) When I was recently in Detroit I made it a point to visit some of the many old former synagogues in the city. My friend photographer Laszlo Regos, who has made so many beautiful photographs of synagogues, joined me on this little expedition and I hope that he'll have the opportunity to return to some of these sites to photograph them more fully. One goal was to see architect Albert Kahn's "other" synagogue - his third and last (that I know of) Detroit synagogue, built in a Byzantine style for Congregation Shaaray Zedek in 1931-32. I've written about Albert Kahn on several occasions, including about his two well-known and influential Classical-style synagogues built for Temple Beth El on Woodward Avenue in 1903 and 1922, and about some of his other many buildings that helped shape Detroit, including the General Motors Buildings and the Fischer Building. Detroit, MI. 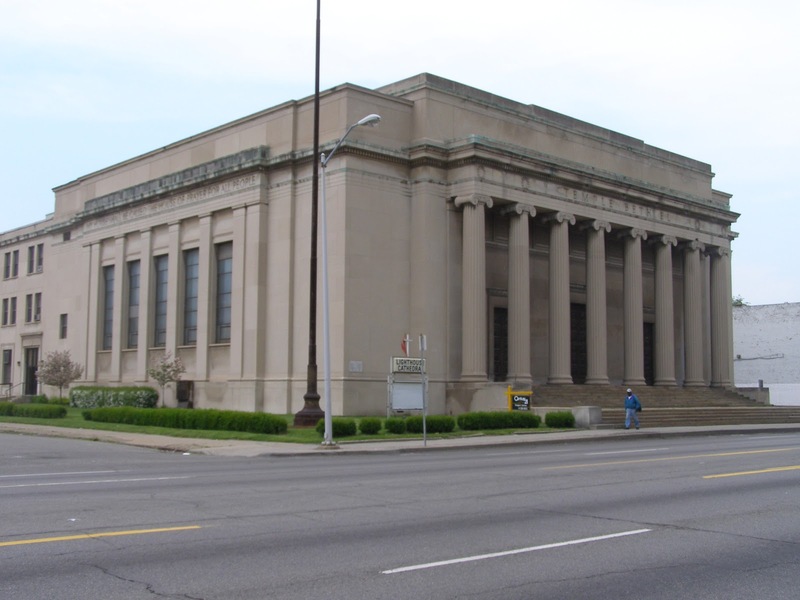 Albert Kahn's classical-style synagogues. Temple Beth El (1903 as built; (middle) Former Temple Beth El (1903) today; (bottom) former Temple Beth El (1922). The Fisher Building and the GM Building created a new civic center for Detroit, on Woodward Avenue, three miles from the old downtown. In 1922, close to this civic ensemble, Kahn designed his second Temple Beth El — now Lighthouse Cathedral — with its impressively wide facade of a giant columnar order. The building was an homage to his old friend, Henry Bacon (the two had traveled together in Europe as young men). Bacon’s design for the Lincoln Memorial had been accepted for Washington in 1912, but in 1922 it was just being completed. The new synagogue was a near-last gasp for the Classical-style synagogue that had been almost de rigueur for Reform congregations in the first decades of the 20th century. Both Beth El synagogues are symbolic of Kahn’s art and his Judaism. Kahn was not ashamed of being a Jew (especially not in the 1920s, when his foremost patron, Henry Ford, disseminated the “Protocols of the Elders of Zion”), and he was proud to see Judaism as a mainstay of civic virtue and cultural enlightenment." The congregation had begun discussion of erecting a new and larger synagogue in 1922 when Shaaray Zedek was growing and money was plentiful. The decision to purchase a lot was made in 1925, and Kahn, the most famous Detroit architect, was engaged by that time. Excavation on the site began in 1927. According to congregation historians Eli Grad and Bette Roth, "There was a consensus that the new sanctuary should seat twenty-five hundred to three thousand, and that the synagogue should include a smaller sanctuary seating five hundred, a chapel for daily services seating one hundred, a hall for meetings and entertainment with a capacity of one thousand, a dining room for twelve hundred, a gymnasium, sixteen classrooms, a library, offices, and facilities for the Men's Club and Sisterhood." In other words, a synagogue center of enormous size. Kahn presented designs to be built for $750,000. But with the delays, and then the onset of the Great Depression, the project was scaled back by a third. It is an important example (and one of the last) of the mature Byzantine style popular for synagogues in the 1920s and 1930s. Kahn and the congregation chose the Byzantine style, which had grown in popularity among Jews in America and Europe since the First World War, and was used by both Reform and Conservative Jews for synagogue design. The Byzantine style was distinctive and for some it recalled the architecture of the Middle East, and so could be claimed (erroneously) to be authentically Jewish. The style was usually expressed in two ways - not always combined. First, designers of Byzantine-style synagogues often experimented with new, geometrically varied massing, especially versions of centrally planned polygonal spaces. Secondly, architects and artists invented a new decorative vocabulary inspired by Byzantine art. Most of this was geometric or vegetal, though there were figures, too. Chicago Architect William Tachau experimented with several plan types in his many synagogue designs. 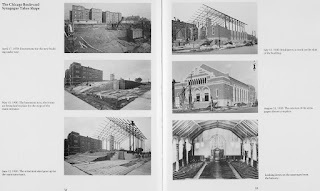 In 1928, just a year before the Stock Market Crash and the onset of the Great Depression put a halt to all new synagogue construction, he described, somewhat critically, the process that created the more central plan for the synagogue sanctuary: “Recently a number of plans have been developed in circular, elliptical and polygonal forms, which again owe their inspiration to Byzantine influence. To obtain the imposing effect that such designs require, the dome must be of a lofty character and so pretentious a venture can be only accomplished at great cost; and in many instances such heights result in poor acoustics – a very serious defect in an auditorium” (Tachau, “The Architecture of the Synagogue,” Architecture (September 1928), 143). Interestingly, Kahn used the Byzantine style to embellish an otherwise traditional synagogue. The special massing created by the two prominent symmetrically placed tower blocks at each end of the façade, however, derive as much from 19th century two-towered synagogues derive, as from Byzantine designs. In his two synagogues for Beth El he produced a domed central plan for the first and a "broad house" design for the second, where one entered on the wide side of the rectangular block, and the seats and a balcony were arrayed widely in the front of the bimah. But at Shaaray Zedek, the main entrance was on the short side of the rectangular (through three church-like portals), as was traditional for many synagogues and most churches. The decoration of the synagogue, especially the menorahs reliefs on the facade, were inspired by Byzantine art, including decorations found on recently excavated synagogues in the Holy Land. Though planned before the 1929 Crash and the onset of the Great Depression, the congregation decided to proceed despite the terrific economic situation. Membership declined, sustained members cut back contributions, and the entire community struggled to make ends meet at home and at the synagogue. The great and expensive Temple Emanuel in New York was just nearing completion at the time of the crash. The money was spent, however, though it was hard to meet expenses during the next decade. Only in Hartford, Connecticut, did Congregation Beth Israel manage to plan and build an impressive Byzantine-style synagogue in the mid-1930s. Because of the strength of the insurance industry Hartford was one of the least hit major cities in the Depression era. Like so many urban synagogues across America, Kahn's Shaaray Zedek was sold to a church when the congregation moved to the suburbs in the 1960's. Since March 1963, Greater Bethlehem Temple has made its home in the building and sustained it longer than Shaaray Zedek. Next year will mark the church's half century in the building. 5) Shaaray Zedek has a long history of erecting, occupying and then leaving monumental synagogue buildings, the process I have dubbed " the continuing exodus." I have written about the continuing exodus in other cities, most recently in an essay (read it here) for the exhibition Silent Witnesses: Migration Stories Through Synagogues Transformed, Rebuilt or Abandoned (Farmington Hills, MI, 2012). The process was pronounced in Detroit, too, especially for the oldest congregation Temple Beth El and Congregation Shaaray Zedek. Shaaray Zedek has been housed in a series of notable buildings including, since 1963, the enormous and sculptural impressive suburban complex designed by Percival Goodman with Albert Kahn Associates. 6) when construction was first proposed it met with considerable public opposition, a good part of which was anti-Semitic. There is a long history of opposition to the erection of synagogues in all types of American neighborhoods - behavior that is now closely paralleled by popular opposition and legal challenges to the erection of mosques. In the 18th century the building site for Congregation Mikveh Israel was moved when members of the Dutch Reform Church protested that the Jewish house of worship would be too close to their church. Today, most challenges to synagogues are against Orthodox congregations which establish synagogues in houses zoned for residential use. In 1925 in Detroit, when it was announced that Shaaray Zedek would buy land at Chicago Blvd and Lawton from the Catholic Diocese of Detroit (!) neighborhood property owners filed a lawsuit - the first of several. These cases which were defended by William Friedman, went all the way to the Supreme Court and helped to form the basis of religious freedom laws today. Some of the opposition was probably legitimate, as home owners feared that the synagogue would bring traffic to the neighborhood, and perhaps affect property values. Underlying the opposition, however, was also Antisemitism, which greatly escalated in the 1920's. Goldman, Norma, 1993. "Albert Kahn: Architect, Artist, Humanist," Michigan Jewish History, 34, 2-16. Gruber, Samuel D., 2009. “The Rabbi's Son Who Built Detroit, The Other Kahn: Architect, The Forward (January 23, 2009).